Every time an earthquake affects a contemporary city, numerous lessons arise regarding the performance of modern buildings. However, lessons included in international postearthquake reconnaissance reports regarding the influence of architectural features on building seismic performance barely reach either architectural and city planning practice, or decisions taken by city officials and politicians that continue including in the design of urban zoning regulations (UZR) some modern building configurations categorized in seismic codes as “irregular.” Irregularities, in terms of building configuration, mean that the structural design and analysis require the application of special considerations, as well as rigorous official controls on the construction site for the appropriate application of seismic detailing requirements. The majority of UZR in contemporary cities encourages, and in some cases enforces, the use of configurations that have been long recognized by earthquake engineering as seismically vulnerable. It is not surprising that when an earthquake affects a contemporary city, the buildings worst hit are precisely those with modern architectural configurations that affect the vulnerability and resilience of cities in seismic zones and are common all around the world. Earthquake experiences have taught that the application of structural engineering oriented building codes is not sufficient for reducing the seismic vulnerability of contemporary cities. The problem has to be untangled with a holistic approach where structural engineers, architects, urban planners, local authorities and the local community participate, not only in reducing existing vulnerability but avoiding the construction of new seismic risk in the future. 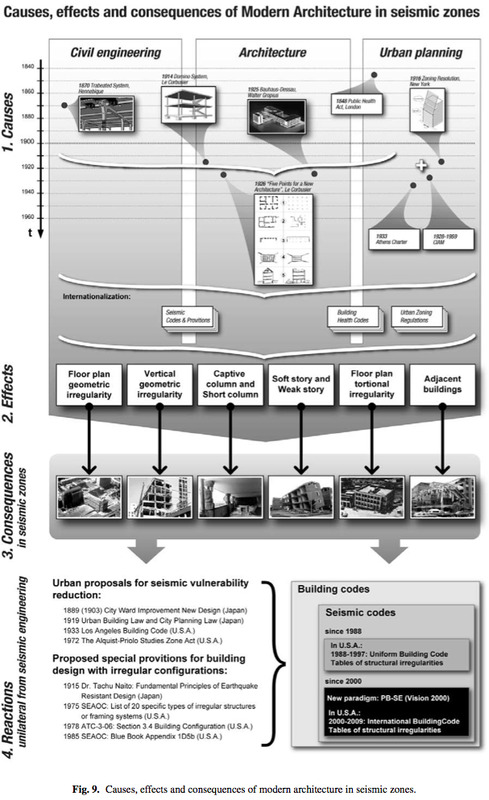 In order to study the discrepancy between urban zoning regulations and seismic codes with regard to vulnerable modern building configurations and the causes of the international dissemination of architectural and urban planning concepts that generate vulnerability in contemporary cities, historic research was developed. This paper presents a brief summary of this study . Keywords: seismic codes, modern architecture, building configurations, urban zoning regulations. Observation of buildings damaged by earthquakes has shown that architectural decisions related to aesthetics, function, cost, circulation, spatial relationships and other concerns affect the shape, dimension and location of structural and “nonstructural” elements, determine the existence and location of forceresisting components and cores, and influence other issues of significance in the design of earthquakeresistant buildings. Most modern irregular configurations and even urban planning decisions that refer to location, distribution and grouping of buildings within the structure of the city, overlook the special considerations that seismically hazardous areas require. Worldwide seismic building codes are written for engineering application and rarely include guidelines related to architectural and urban features. In response to urban planning requirements and health, most urban zoning ordinances in contemporary cities encourage and even enforce the use of certain irregular building configurations such as soft first stories, setbacks and adjacencies of buildings that worldwide experience indicates considerably affect the ability of buildings to withstand earthquakes and therefore increase seismic risk. Most seismic codes that include special considerations for irregular configurations are written in analytical terms for engineers who are specialists in seismic design and are difficult for architects and urban planners to understand. For understanding the influence of architectural configurations on building seismic performance, conceptual knowledge on the effects of mass, stiffness and resistant distribution in buildings is necessary. Whether we are dealing with large or small scale disaster events, both have a common characteristic. Their occurrence is related to the prior existence of risk, a condition that implies the interaction in time and space of what are known as hazard and vulnerability factors that generate conditions that presageand announce future disaster. That is to say, risk is a latent condition, whilst disaster represents the actualization of existing risk conditions where the physical event serves as a detonator of disaster, but not its final cause. Risk is generated by a series of complex social processes that are instigated by different social actors and at different spatial scales. And, the playing out of risk when transformed into disaster always has a concrete and differential expression at the local level. Postulates of modern architecture and urban planning respond to international patterns that were established since the 19th century. The Industrial Revolution produced the rapid growth of cities and it was responsible for important changes in the patterns of living and working. According to K. Frampton  and other famous architectural historians, during the second half of the 19th century, most of the capitals and important cities of the Western industrialized countries underwent urban renovation in their downtowns following Baron Haussman’s urban planning concepts adopted in Paris. These new downtown urban regulations controlled the total building height, adjacencies and alignments in main urban areas in order to create the “urban street wall.” However, overcrowding, physical deterioration, absence of sanitation and complex socioeconomic factors produced extensive slums in the peripheral industrial areas. Simultaneously, the development of new building construction materials, such as steel, reinforced concrete and large glass panels, and innovative construction technologies, such as mass production, escalators, safety breaks for public use elevators, and electric elevator technology, produced significant changes in the new structural engineering, architectural and urban patterns that from the beginning of the 20th century originated the present urban and building configuration in contemporary cities. At the beginning of the 20th century, a group of progressive modern architects and the recently professionalized discipline of urban planning, and later urban design from nonseismic prone zones of Europe and the eastern U.S., reacted against the messiness created by factories in postindustrial cities. As K. Frampton  explains, in 1928 a group of these professionals met in Switzerland and founded the Congre`s Internationaux de l’Architecture Moderne/CIAM, (International Congress of Modern Architecture). During the first phase of CIAM evolution (19281933) this group struggled to change certain urban regulations and traditional architecture in order to promote social justice, discuss and establish concepts and prescriptions regarding modern architecture and urban planning, improve environmental conditions, and provide decent and sanitary housing for the new urban inhabitants. The Athens Charter, published in 1943, set out postulates for urban development. The premises of that document were interpreted worldwide by architects, city planners, officers and politicians as the noncontextualized model guidelines for “The city of the future” and the features that represented progress. In the 1950s, the Modern Movement developed into a more sophisticate style and birthed the “International Style” that generalized worldwide the concept of “individual building” conceived as an independent unit, as well as the high rise glass corporative buildings in financial districts. At the end of the 19th century, the collective response of a diverse group of architects to the reconstruction of Chicago following a disastrous fire in 1871, combined with the advances in the USA in the production of steel frame structures, the security brake for elevators and long span glass, triggered the construction of the first skyscrapers. In France, engineer F. Hennebique developed in 1892 a new structural system, “the Trabeated,” and demonstrated the strengths of concrete reinforced with steel rods. This new material made possible structures that created the bases for the development of the new modern architecture. Brick, mortar, stone and wood were left behind. Belgian architectengineer Auguste Perret experimented with the Trabeated system in 1903 with the first reinforced concrete (RC) building on 25 bis Rue Franklin, Paris. In this eightstory high apartment building, Perret clearly separated the RC frame structure that supported the entire load and provided large clear spans between columns from the exterior walls, whose only function was to separate the interior space from the exterior. This structural system also allowed a free floor plan since interior partitions did not support any weight and provided freedom for modifying the location of those partitions. 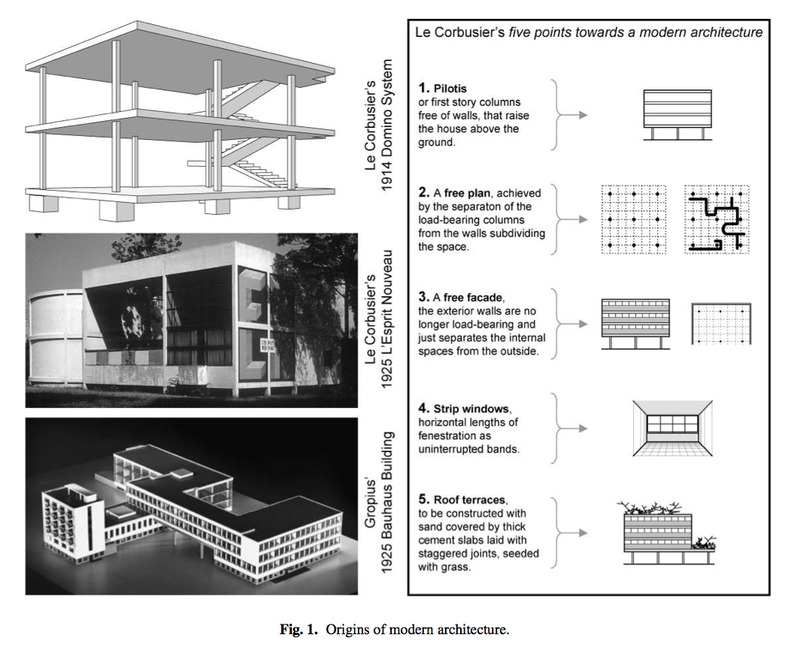 In 1914, SwissFrench architect Le Corbusier (LC), developed the Domino System for economic housing, characterized by the standardization of building components, repetition of model building, industrial organization for the production of components, elemental RC frame, structural system constituted of slender columns named pilotis, and flat solid slabs that covered long spans between columns without girares. The gravity loadbearing structure consists of RC solid slabs (cast in place or precast), transferring the gravity loads to the columns and finally to the footings. The features of this model housing constituted an early example of what later were the bases of modern architecture, known as the famous five points towards a modern architecture. LC applied those ideas in the model of house Citrohan 2 and made them real in 1925 with the construction in Paris of the Pavillon de l’Esprit Nouveau, later reconstructed in Bologna, Italy. In 1919, German architect Walter Gropius founded the Bauhaus, the German School of Architecture and Applied Arts. In 1925, Gropius designed the Bauhaus building in Dessau, Germany, constituted by various volumes joined in an asymmetrical Ushaped floor plan, with an open first story (soft story) and strip windows that became a symbol of modern architecture. The features of the Domino system and Bauhaus building constituted the bases of modern architecture that are contained in LC’s famous five points towards a modern architecture published in 1926, illustrated in Fig. 1. During the 1930s, many modernist European architects and urban planners, and Bauhaus faculty members, fled from European dictatorships, and later from World War II, to the USA and to other countries in the Americas and the European colonies. As a result, the Modern Movement spread quickly around the world. LC was especially successful in obtaining followers and constructing modern buildings in Iberoamerica, the French colonies and, at that time, the recently independent India. Even Japan, after World War II (19391945), wanted to show that they were adapting to the Western idea of “progress” symbolized by modern corporative buildings. During the second half of 20th Century, frame structures and modern building configurations surpassed Japanese construction tradiciones. The term International Style came to refer generally to modern European architecture of the 1920s and 1930s, and the later modern architectural patterns that spread rapidly all around the world, culminating in the present configuration of contemporary cities. In the 1940s, Mies van der Rohe one of the pioneers of Modern architecture and later of the International Style, designed some of the first famous modernist buildings in Chicago, combining new modern materials and construction technology. Urban zoning regulations or ordinances are instruments by which municipalities are organized. The main objective of them is to regulate the use of land in a way beneficial to its inhabitants, and also efficient for commercial and governmental organizations. These urban regulations in cities located in seismic zones usually do not include special seismic provisions and are very similar to those located in nonseismic prone áreas. The following paragraphs briefly describe some examples of how UZRs in most contemporary cities frequently encourage the use of those building configurations by giving rewards or premiums for other communityoriented benefits, and sometimes esforcé them. The urban street wall configuration is constituted by buildings that are adjacent to each other in each block and their main facade aligned parallel to the street line as one continuous building along the street edge. Some examples are illustrated in Figs. 2 and 3. Its origin comes from the 19th century, when important cities of the Western industrialized countries underwent urban renovation. Downtown renovation included the simultaneous construction of adjacent buildings by blocks, sharing the propertyline walls, with the same height and using similar construction materials and techniques. Until then, in the traditional city, individual independent buildings represented mostly important public and private institutions, churches, palaces, etc. In traditional downtowns, corporative and new modern commercial buildings disrupted the homogenous urban street wall turning downtowns into a heterogeneous “collage” of traditional and modern single buildings. With the endorsement of Modernist individual building and the laisser faire doctrine (let each one to do what she/he wants), UZRs relaxed. Now each modern building is placed in the existing traditional block as a structurally independent unit as in Fig. 3. However, several problems arise when neighboring buildings are not taken into consideration. If neighboring buildings’ load resisting system consists of load bearing shared walls, special care has to be taken not to weaken the lateral force strength of those buildings when they are split by a property line, and consideration must be made of the effects that those existing structures can produce in the new one, and the new one on the existing ones (Fig. 4). If neighboring buildings are modern, other type of problems may be present. Special care should be taken in both building’s foundation interaction. Pounding between adjacent buildings due to interstory drift can occur when, (a) adjacent buildings have different period of vibration, each building moves in a different direction at the same time, and they can crash into each other; (b) each adjacent building has a different interstory height the crashing of slabs of one into vertical components of the other can produce serious damages and even building collapse. Another problem between adjacent buildings without seismic joints is the partial immobilization of lower stories of a tall building by lower adjacent buildings that can produce damage in the transition zones between the lower stiffened stories and the free flexible portion as illustrated in Fig. 5. As shown in Fig. 6, in corner buildings torsional irregularities can be present due to irregular distribution of rigidity; if a floor plan is rectangular, two open fac ̧ades to the streets and two “blind facades” stiffer than the other two can produce eccentricity and rotation on horizontal components, that in turn can produce pounding effects in adjacent buildings; If a floor plan is triangular (nonparallel systems irregularity), not only eccentricity but, if the building is tall, overturning effects could occur. UZRs incorporated Setback regulations since the N.Y. City 1916 Zoning Resolution that established height and setback controls when the city became the financial center of the US and the massive construction of tall buildings started depriving neighboring properties of light and air. Fig. 7 shows examples of different types of setback configurations: (a) stepped (modern “wedding cake” style) and (b) two or threestory solid street fronting base and setback towers. These configurations could produce the following: outofplane offsets; stiffness irregularity; weight (mass) irregularity; vertical geometric irregularity; inplane discontinuity in vertical lateral force resisting elements. The soft first story and weak story irregularities are widely used by architects in their designs since it is one of the main features of LC’s five points known as “pilotis.” These conditions are present when either the first story of a frame structure is free of walls while stiff nonstructural walls are present in the upper ones, or when shear walls are located in the upper stories and they do not follow down to the foundations, but interrupt at the second floor. Fig. 8 shows the deformation caused on a building with a regular distribution of stiffness at the left, and a soft story deformation, at right; and some examples of the ground shaking effects on buildings with such configuration, due to earthquakes in: Northridge, California (1994); Chichi, Taiwan, andIzmit, Turquía, in 1999; andBhuj, India in 2001. Most UZRs encourage the use of soft story irregularity because the area enclosed by a soft first story is rewarded to the owner since it is neither computable as part of the maximum allowable built area, nor for tax control, but they are computable for selling purposes. These areas at the first story are mostly used for social events, parking garages, and other activities that require layouts free of walls. From the beginning of the 20th century, researchers that studied the effects of earthquakes on structures recognized that there exists an evident relationship between the modern architectural configurations and the seismic performance of buildings. In the majority of building codes that are in force at present one of the most important factors that have to be considered for deciding the analysis procedure to be used for the RC building structure design, is the evaluation of the building’s level of irregularity in plan and in elevation. At present most seismic codes include special requirements and penalties for the analysis of buildings with irregular configurations. In relation to architectural configurations, G. Berg  mentions that “Dr. Naito proposed four fundamental principles of earthquake resistant design: First, a building should be designed to act as much like a rigid solid body as conditions would permit. To this end, structural members should be rigidly connected and generously braced. Dr. Naito saw this as a way to keep building periods short and thereby prevent resonance with ground motion. Second, a closed plan layout should be used; that is, the plan shape of the building should be a complete closed rectangle rather than a U, L, T, or H shape. Third, rigid walls should be used abundantly and disposed symmetrically in plan, and they should be continuous over the height of the building. Fourth, lateral forces should be allocated to the bents of the building in accordance with their rigidities. He developed a modified portal method of frame analysis that would permit rapid and reasonably accurate analysis of a bent to determine its rigidity. However, the postulates of CIAM were spreading all around the world as the new paradigm that represented the model guide for ‘The city of the future’ and the features that represented progress. Arnold and Reitherman  comment that until 1973 the Uniform Building Code (UBC) didn’t include any seismic regulation or recommendation for irregular configurations. In the 1970’s, due to the destructive effects produced by recent earthquakes in modern buildings (Anchorage, 1964; Caracas, 1967; San Fernando, 1971; Managua, 1972; Guatemala City, 1976; Imperial Valley, 1979), a group of architects in California participated in significant studies with earthquake engineers, to promote the inclusion in seismic codes of some special recommendations for the design and construction of buildings with modern architectural configurations. Also, several articles and books were published with recommendations for architectural design in seismic zonas. However, until 1974 building codes didn’t include special provisions for buildings with irregular configurations. In 1975 SEAOC included in Recommended Lateral Force Requirements and Commentary of the Blue Book 1974 twenty examples of irregularities that had to use dynamic analysis methods instead of the traditional equivalent static force method and recommended them to be included in the next version of UBC. These recommendations were not considered for the 1976 UBC. In 1978 SEAOC published the ATC306: Tentative Provisions for the Development of Seismic Regulations for Buildings that included a section on Building Configuration with a series of drawings that were supposed to be included in the 1979 UBC but in the end, were not. At last, after the Mexico earthquake of 1985, the 1988 UBC edition included two tables defining some parameters for the identification of “irregular” configurations, in plan and elevation. Since then many recent seismic codes around the world have included special provisions for the following configurations: Plan: torsional irregularity; extreme torsional irregularity; reentrant corners; diaphragm discontinuity; outofplane offsets; nonparallel systems. Vertical: stiffness irregularity – soft story; stiffness irregularity – extreme soft story; weight (mass) irregularity; vertical geometric irregularity; inplane discontinuity in vertical lateralforce resisting elements; discontinuity in capacity – weak story; extreme weak story. Figure 9 illustrates: the origin of modern building and urban configurations in contemporary cities; some examples of modern building irregular configurations and the effects of ground motion on them; and, as a consequence, the development during the 20th century of earthquake engineering and of seismic provisions for the design and construction of RC earthquakeresistant buildings. 1 Reconnaissance reports, usually published shortly after each earthquake strikes contemporary cities all around the world, describe failures in buildings with those configurations identified in building codes as nonrecommended in seismic zones, such as setbacks and first soft story. 2 From the beginning of the 20th century structural engineering researchers recognized that there exists an evident relationship between certain architectural configurations and the seismic performance of buildings. Meanwhile in nonseismic prone zones of Europe and the USA, architects, urban designers and city planners originated a new architectural and city planning paradigm that guided the evolution of contemporary cities all around the world in the opposite direction. As it was explained in section 4 of this article, UZRs that follow modern architectural patterns, enforce, promote, and in some cases force in the majority of contemporary cities located in seismic zones, the use of building configurations considered in seismic codes as not recommended unless special requirements are accomplished. Examples include urban street wall configurations in downtowns and use of soft story and weak story irregularities. 3 Most architects, city planners and urban designers as well as city decision makers, unknowledgeable of the previous asseveration, have considered, since seismic codes were first published, that the mitigation of urban seismic vulnerability is an exclusive responsibility of structural engineers through the application of seismic provisions included in building codes. Some structural engineers also consider that it is their own responsibility and not that of architects and urban planners. 4 The urban policies of Marquis of Pombal, set up for the reconstruction of Lisbon as a splendid city after the famous 1755 Lisbon earthquake, developed the first provisions for the construction of earthquakeresistant buildings and for disaster mitigation. However, that experience apparently had minimal influence on the following urban zoning regulations of new sectors of cities in seismic zones. 5 It has not been, is not, and never will be sufficient to apply seismic building codes!!! It is necessary to not only develop and bring about a multidimensional and interdisciplinary approach, but also a transdisciplinary one for applying instruments for the reduction of seismic vulnerability and enhancing resilience of contemporary cities. This approach must include not only the participation of earthquake engineers, architects, city planners, and other professionals but also the active participation of city officials and decision makers. 6 At present, seismic resilience of contemporary cities depends mainly on the application of seismic codes to single buildings as independent units and is not treated as a holistic approach because seismic codes do not consider the effects that a new building could produce on the seismic performance of neighboring buildings or the surrounding environment. Contemporary cities in seismic zones are not an addition of independent buildings; each city is a system constituted by interrelated components. Damages in one building due to earthquake effects may not just affect the people who are inside but people passing by, the neighboring buildings, and the surrounding environment, producing chaos in the city. 7 It is necessary to inform and instruct architects and city planners on the consequences of their urban planning and architectural decisions, since they share with structural engineers the great responsibility in mitigating seismic risk and in reaching seismic resilience in contemporary cities. 8 It is essential to convince city officials, urban planners and decision takers of the urgent necessity of revising and changing actual UZRs in cities located in seismic zones. They must also include special descriptions and prescriptions for the design and construction of new buildings and the remodeling of existing ones. 9 There is a lack of conceptual knowledge on the influence of architectural configuration on building seismic performance amongst building designers. It is necessary to include this conceptual knowledge instead of exclusive analytical procedures in course work covering seismic zones related to formal education programs for architects, city planners and structural engineers. Allan Lavell, “Local Level Risk Management. Concepts and Expe- rience in Central America,” ponencia presentada en Disaster Pre- paredness and Mitigation Summit, 21-23 de noviembre de 2002, Nueva Delhi, India, pp. 2-3. Kenneth Frampton, “Modern Architecture: A Critical History,” Thames & Hudson; 4th. Edition, London 2007. R. Reitherman, “The Effects of the 1906 Earthquake in California on Research and Education,” in Earthquake Spectra, April 2006, 22:S2, S207-S236, Oakland, CA, 2006. G. V. Berg, “Seismic Design Codes and Procedures,” EERI, Berke- ley, CA, pp. 23-24, 1983. Ch. Arnold, and R. Reitherman, “Building Configuration and Seis- mic Design,” John Wiley-& Sons, Inc., New York, 1982.